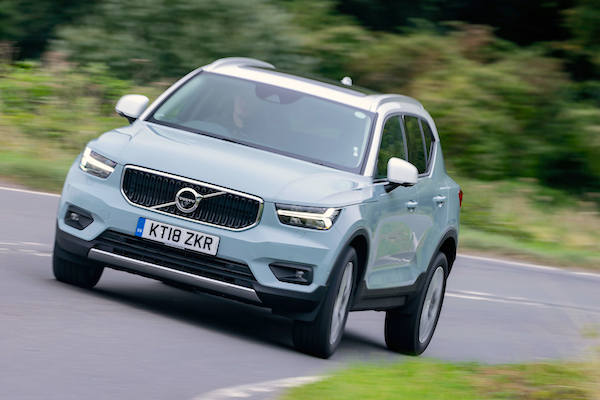 The Volvo XC40 breaks into the Swedish monthly Top 5 for the first time. -49.4% in July, -17.5% in August, -39.6% in September, -28.1% in October and now -20.5% in November: the Swedish new car market endures a 5th consecutive month of double-digit decline, impacted by two pull-forward events earlier in the year: a new Bonus/Malus system taxing polluting cars implemented on July 1 and the new WTLP testing norm implemented on September 1. As a result, year-to-date volumes are now down 4% to 330.729. In the brands ranking, both Volvo (-22%) and Volkswagen (-37%) fall faster than the market but remain on top, ahead of Kia (-14%) while BMW (+2%) and Mercedes (+3%) post the only two gains in the Top 10. Skoda (-1%) and to a lesser extent Toyota (-15%) manage to also beat the market but Renault (-48%), Audi (-45%) and Peugeot (-29%) struggle mightily. Outside the Top 10, Alfa Romeo (+279%), Jaguar (+75%), Jeep (+74%), Seat (+20%), Opel (+16%) and Mitsubishi (+11%) stand out while Porsche (-70%), Dacia (-58%), Citroen (-53%), Hyundai (-35%), Suzuki (-34%) and Mazda (-30%) crash down. Model-wise, the Volvo S/V90 (-20%) holds onto the top spot at 6.6% share but the VW Golf (-8%) lurks just 28 units below. Volvo places three additional nameplates inside the Top 5: the S/V60 (-34%), XC60 (-31%) and XC40 among its home five best-sellers for the very first time – also a world first. The Kia Niro (+31%) is the brand’s best-seller at #9 ahead of the Optima (+55%) at #12, the Nissan Leaf is up 43-fold on the previous model at #17, with the Seat Arona (+642%), Opel Corsa (+385%), Hyundai Ioniq (+257%), Fiat Tipo (+165%), Renault Zoe (+116%), Toyota C-HR (+99%), Ford Focus (+73%), Mercedes C-Class (+54%), VW Polo (+54%), Opel Astra (+46%) and Seat Leon (+42%) also impressive in the Top 50. The Audi Q8 is up 29 spots to break into the Swedish Top 100 for the first time at #90. Full November 2018 Top 45 All-brands and Top 250 All-models below.